You may be surprised that none of those things will work. But God has made it very clear in the Bible how we can know Him and that He has made a way. Principle 2: All of us sin and our sin has separated us from God so we cannot know Him personally or experience His love. indifference, is evidence of what the Bible calls sin. life, philosophy, or religion -- but we inevitably fail. Principle 3: Jesus Christ is God's only provision for our sin. Through Him alone we can know God personally and experience His love. 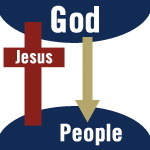 This diagram illustrates that God Himself has bridged the gulf which separates us from Him by sending His Son, Jesus Christ, to die on the cross in our place to pay the penalty for our sins. Principle 4: We must individually receive Jesus Christ as Savior and Lord; then we can know God's personally and experience His love. Receiving Christ involves turning to God from self (repentance) and trusting Christ to come into our lives to forgive our sins and to make us the kind of people He wants us to be. Just to agree intellectually that Jesus Christ is the Son of God and that He died on the cross for your sins is not enough. Nor is it enough to have an emotional experience. You receive Jesus Christ by faith, as an act of the will. The following explains how you can receive Christ: You can receive Christ right now by faith through prayer. Prayer is talking to God. God knows your heart and is not so concerned with your words as He is with the attitude of your heart. 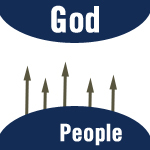 Learn more about developing and growing in this new relationship with God. The adventure of this love relationship with the Creator of the Universe and following Jesus has just begun! I did not ask Jesus into my life but I have questions about what I have read, or watched on this website. Crusade for Christ. © Campus Crusade for Christ. All rights reserved.